Finding out that a child has dyslexia can be shocking and confusing – and thousands of parents get this disturbing news every day. Appearing as early as when a child is struggling to say ‘Mama’ and ‘Dada,’ dyslexia is a condition that will affect a child’s ability to read, write, and understand basic language construction and for a parent, this can be a tough reality to take in. Covering information on every stage of diagnosis, treatment, and growth, When Your Child Has… Dyslexia will help parents: Teach children how to cope with educational, personal, and social difficulties. Choose the right school and reduce academic struggles. Maintain communication with their frustrated child Providing parents with the invaluable information and resources they need, When Your Child Has…Dyslexia takes an in-depth look at the reality of the disability and manages to make sense of it for worried parents. Abigail Marshall (Pacifica, CA) has been the manager of the Dyslexia.com and moderator of the DyslexiaTalk.com forum since 1995. She is the mother of a son with dyslexia, and she has a B.S. degree in applied behavioral sciences and a law degree. Ronald D. Davis, who was diagnosed at infancy with severe autism, overcame his own learning challenges and refined his methods over years of working with hundreds of children with dyslexia. He is the Founder of Davis Dyslexia Association International and the Reading Research Council. One in five American children has trouble reading. But they are not stupid or lazy. 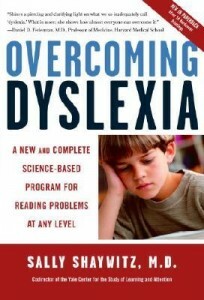 In Overcoming Dyslexia,” “Dr. Sally Shaywitz, codirector of the Yale Center for the Study of Learning and Attention and a leader in the new research into how the brain works, offers the latest information about reading problems and proven, practical techniques that, along with hard work and the right help, can enable anyone to overcome them. Here are the tools that parents and teachers need to help the dyslexic child, age by age, grade by grade, step by step. Help your child succeed in the classroom–and in life! As a parent of a child with dyslexia you may wonder what you should expect as your child goes through life. How can you help your child deal with school and succeed? It’s true, there are challenges for children with dyslexia, but when identified early, they can be overcome successfully. 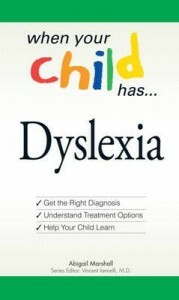 Abigail Marshall, manager of dyslexia.com, shows you how to: Identify the early symptoms of dyslexia. Work with teachers to create an Individualized Education Program (IEP). Reduce homework struggles. Find the best treatment program. Help your child develop skills with the use of assistive technology. Plan for college and career. 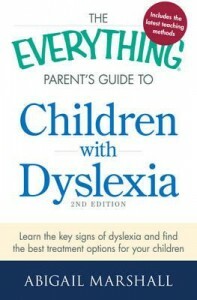 The Everything Parent’s Guide to Children with Dyslexia, 2nd Edition is your first step in facing the challenges of dyslexia with a positive attitude. About the Author Abigail Marshall is the mother of an adult son with dyslexia. She manages dyslexia.com, dyslexiatalk.com, and dyslegia.com; and writes about brain function, reading techniques, brain studies, and strategies for dealing with dyslexia. Her column appears regularly in The Dyslexic Reader, a quarterly online and print publication. She is the author of The Everything Parent’s Guide to Children with Dyslexia. She lives in Pacifica, CA. Winston Churchill, Andy Warhol, Walt Disney, Tom Cruise, Agatha Christie, Pablo Picasso. All famous and successful in their chosen professions. All dyslexic. Around 5 to 15% of speakers of alphabetic languages (e.g. 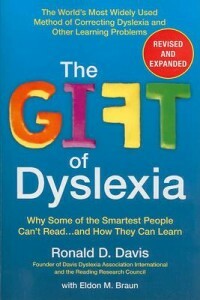 English, French and Spanish) are dyslexic; around 4% severely so. But what is dyslexia? Are there different types of dyslexia? Is it more likely to occur in boys than in girls? Is there a cure? What resources are available to help dyslexic children and adults? Nicola Brunswick answers these, and other, questions informed by current thinking and cutting-edge research. 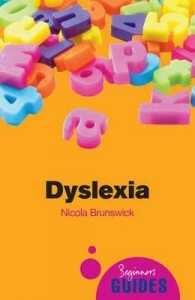 Includes chapters on the causes and symptoms of dyslexia, the importance of sound and vision to reading, the incidence and manifestation of dyslexia across alphabetic and non-alphabetic languages, and lists of dedicated dyslexia resources – support associations, websites, and assistive technology. This book will help you take Immediate Control of your Child’s Destiny!